Recently, the Georgian government has approved the state program for years 2015-2018 in order to assure that these competitions will be organized at a high level. The other goals of the program include providing assistance for Georgian chess players and organizers, as well as supporting the Tbilisi Chess Academy and promoting the movement 'Chess in Schools'. The full statement by the Georgian Chess Federation can be viewed at the FIDE website. Georgian Chess Federation (GCF) publishes an open letter asking why the president of the European Chess Union Silvio Danailov publicly supports the bid of African Cameroon, but not European Georgia for the Olympiad 2018. 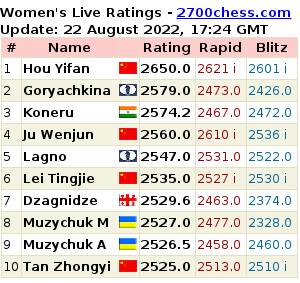 FIDE has announced the 2015-16 women's Grand Prix series, the results of which will determine one participant in the 2017 world championship match. 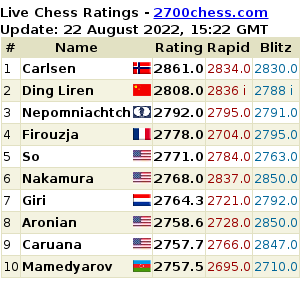 The FIDE website published the table of the participants of the new Grand Prix Series. Bela Khotenashvili: "I Consider This Result As the Best One in My Career So Far"
"I’m very happy to win this tournament and consider this result as the best one in my career so far. I would like to thank Georgian chess federation, President of GCF Gia Giorgadze and our coach Davit Jojua for their help," Bela Khotenashvili has been quoted by the official website of the Geneva Grand Prix.